Update: Israeli forces had already hijacked the lead vessel in the four-ship convoy by early morning on Monday ET. BETHLEHEM (Ma’an) — Israeli naval forces are preparing to intercept the Gaza-bound Freedom Flotilla III which is expected to arrive in Gaza on Monday, Israeli media reported Sunday. Activists on board the flotilla sailing towards Gaza to challenge Israel’s blockade of the strip are quickly nearing their destination but expect to be intercepted, an Israeli television journalist with them reported late Sunday. “We have been at sea for three days and we are at a distance of no more than 200 kilometers (125 miles) from the Gaza Strip,” Channel Two’s Ohad Hemo said in a broadcast from the deck of the Swedish-flagged Marianne of Gothenburg. “It’s not clear when we’ll arrive. Will we wait for the other three boats that are behind us or try to break through to the Gaza Strip first,” Hemo reported. An Israeli army spokesperson told Ma’an they weren’t able to elaborate on possible preparations being taken by the Israeli naval forces in anticipation for the flotilla’s arrival. The Freedom Flotilla is the third of its kind to attempt to break the nearly nine-year Israeli blockade of Gaza that has left its 1.8 million residents in what rights organizations have termed a humanitarian crisis. In May 2010, Israeli forces staged a raid on a six-ship flotilla which ended in bloodshed, claiming the lives of 10 Turkish rights activists. 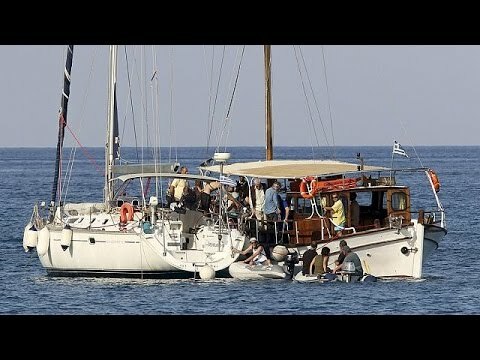 The first of four vessels from the Freedom Flotilla III set sail for Gaza from the Greek island of Crete overnight Thursday of last week, carrying 70 rights activists, journalists and politicians, together with a cargo of humanitarian aid, solar panels, and medical aid. The crew includes Palestinian member of Israeli parliament Basel Ghattas, Tunisia’s former president Moncef Marzouki and at least one European lawmaker. Hemo said that the passengers on the vessel get twice daily briefings from the organizers on non-violent resistance to the Israeli commandos they expect to board the boat sooner or later. “We have seen on the sonar an unidentified vessel following us at a distance of about 20 (nautical) miles and the assumption is that it is an (Israeli) naval ship,” he said. “It is clear to everyone that commandos will board somewhere before entry to Gaza,” he added. The Israeli government on Sunday published a letter which will be handed to flotilla participants once they are in Israeli hands. “If and when they reach Israel they will get a nice letter,” foreign ministry spokesman Emmanuel Nahshon told AFP. “Welcome to Israel!” said a Hebrew-language text of the message seen by AFP which will be given to the activists in English. “It looks as if you lost your way,” it continues.